The first-ever Duquesne University School of Pharmacy Lip-Sync Competition raised $1,048 Wednesday night as members of the Pharmacy Greek organizations and School of Pharmacy faculty members performed in front of over 200 students, faculty and staff in the Student Union Ballroom. 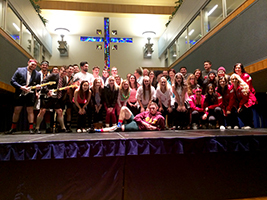 Phi Delta Chi organized the event with help from Kappa Epsilon, Lambda Kappa Sigma and Kappa Psi. "I think it's safe to say that the Mylan School of Pharmacy just found a new tradition," said Gregory Caspero, Phi Delta Chi Risk Management Chair and the emcee for the evening. "I am proud to have collaborated with all of the Pharmacy Greek organizations and professors to put on such a great event." Every group picked a charity before the event and competed for a percentage of the funds raised to donate. Kappa Psi won the competition with performances of "I Love It" by Icona Pop and "Single Ladies (Put A Ring On It)" by Beyoncé and donated nearly $700 in winnings to the American Heart Association. Lambda Kappa Sigma finished in second place with performances of "Barbara Ann" by the Beach Boys and the Michael Jackson classic, "Thriller," and donated over $200 to Project Hope. Kappa Epsilon and Associate Professor of Pharmacy Practice Dr. John Tomko tied for third place, good for nearly $60 a piece to the Pediatric Asthma and Clinical Research Center of Pittsburgh and the St. Vincent de Paul Society of Pittsburgh. After ticket sales and a donation drive during the perofmances, all seven charities received some of the proceeds. "An event like this corresponds with the values and focus of our school, and is a strength that makes Duquesne unique," Caspero said. "Community outreach is such an integral component of who we are, and is part of what makes us all 'Duquesne pharmacists.'" Tomko, along with fellow faculty members Drs. Jane Cavanaugh and Patrick Flaherty covered a wide array of genres spanning from Toby Keith to Vanilla Ice to Iggy Pop, while Drs. Branden Nemecek, Robert Laux, Riccardo Boni and David Zimmerman banded together to pay homage to the late David Bowie with a performance of the Bowie/Queen collaboration, "Under Pressure." Drs. 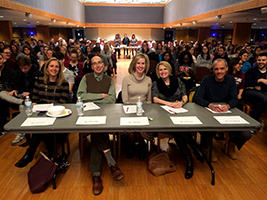 Karen Fancher, Marc Harrold, Monica Skomo, Autumn Stewart and Robert Stratford served as judges for the competition and gave glowing reviews to all the performers. The Phi Delta Chi group failed to place despite theatrical performances of "TNT" by AC/DC and "Sorry" by Justin Bieber but deserve a lot of the credit for helping bring the event to life. Click Here To View Photos From The Competition On Facebook!